Today, I along with two other members of Divest Harvard met with two members of the Harvard Corporation Committee for Shareholder Responsibility. This was our second meeting with the Trustees. While the trustees understand the seriousness of climate change and believe that we need to mitigate fossil fuel use, they do not see why divestment will be an effective tactic. However, one member of the CCSR, Nannerl Keohane, stated that–instead of divestment–Harvard should “thank BP” for developing clean energy. This is an outrageous argument because BP a) was responsible for the Deep Water Horizon oil spill b) announced on Tuesday that it was going to sell 16 wind farms that it currently owns and focus on fossil fuels and c) stopped producing solar panels. We should not be thanking BP for anything. We ask them to divest from fossil fuels, and we are told to thank a fossil fuel company! 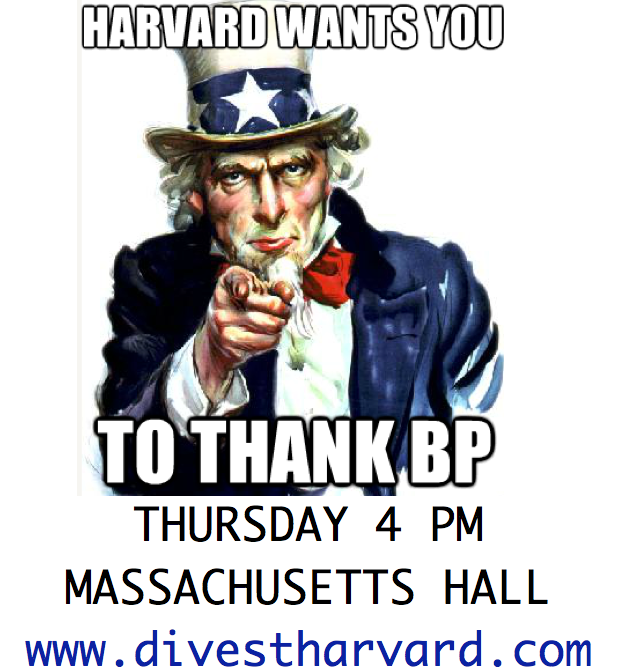 At the Divest Harvard rally on Thursday at 4 pm, we will not only deliver our ~1500 petition signatures in support of divestment but also “thank BP” (note the sarcasm). Spread this meme! Come to the rally! Divest Harvard Rally Tomorrow At 4 PM!! !